We’d love your help. Let us know what’s wrong with this preview of The Mill on Magnolia Lane by Tilly Tennant. When Lizzie loses her larger-than-life Dad she doesn’t know how to move forward. Encouraged by a childhood dream she shared with her beloved f The sky is cornflower blue, the air is scented with the smell of fresh apple blossom and Lizzie Lovell can’t wait to start her new life in the mill on Magnolia Lane. But is she just about to fall in love with someone she shouldn’t? To ask other readers questions about The Mill on Magnolia Lane, please sign up. Lizzie has lost her much love father, so she decides she will purchase the old mill to honor the dream that they shared. The thing is the mill is in need of some s A heartwarming story packed with love and family! This book made me want to move to a windmill or at the very least to a small English Village. Tilly Tennant Rights stories with such charming and realistic characters. At the end of this book I felt as though I was saying goodbye to good friends, I am hoping there will be a follow up. Lizzie was a very likable character and I loved her growth throughout this book. Lizzie really finds her self in some tough situations that I am not sure how I would handle myself, I generally completely agreed with her decisions and understood where she was coming from. Jude? Loved him... hated him... loved him... The secondary characters were all pretty spectacular, I loved getting to know Lizzie’s family, but Charlie stole the show. Charlie was Jude’s younger brother, he is on the autism spectrum and his bluntness was refreshing. There was A romance in this book, however it also really touched on the love of family. Lizzie Lovell’s dad has recently passed away. Re-evaluating her life she decides to sell her home and purchase a windmill just outside the little village of Piriwick. Her dad had always wanted to buy the mill but had never gotten around to it.The mill, unfortunately, is falling apart but Lizzie is determined to bring it back to its former glory. She even decides to live on site in a small caravan so she can help oversee the work and help out too. After losing her Dad, Lizzie has a mad moment and buys the dilapidated windmill her Dad had always admired. She ups sticks and lives in a caravan on-site while the renovations are being done. She is single and works from home so it’s ideal for her. Her family think she is bonkers though. We get to meet her family, Mum, sister and brother. And her lovely stepmum. There are many ups and downs between them all. Many touching and emotional scenes which the author writes so b A lovely feel-good story. All my reviews are quite short and concise as I'm here to show off the book rather than my own writing ability. A highly enjoyable novel! The characters were fun and very realistic and while there was a romance in this novel, I loved that it focused much more on the family relationship between siblings, parents and step parents. A perfectly lighthearted summer read! Over the course o I really hope this is the start of a new series, as by the end of this book, I just didn't want it to end. I loved the Mill and its rennovation work, and the way that Lizzie develops over the book is great. On a whim following her dad's death, Lizzie buys an old mill that she is determined to restore and make a working mill again. I enjoyed the aspect of her visiting another mill to see how things worked and the renovation side of things but unfortunately this seemed very much a bit part to the story and I would have loved to hear more on this. Lizzie's neighbour is Jude (male) and it just felt like I blinked and then they were in a relationship, there was very little build up to this. Jude has a fr On a whim following her dad's death, Lizzie buys an old mill that she is determined to restore and make a working mill again. I enjoyed the aspect of her visiting another mill to see how things worked and the renovation side of things but unfortunately this seemed very much a bit part to the story and I would have loved to hear more on this. Lizzie's neighbour is Jude (male) and it just felt like I blinked and then they were in a relationship, there was very little build up to this. Jude has a friendly relationship with his ex Harriet, with whom he shares a son. Lizzie struggles with their close friendship and so ends her relationship with Jude and I may be in the minority but agreed she needed some time apart from him to understand her true feelings. We are introduced to a wider range of Lizzie's family but I didn't really feel any warmth towards them but they certainly had more than their fair share of sadness throughout. The best character was undoubtedly Charlie, Jude's younger brother, who appears to have a form of autism and therefore tells it like it is and is very literal - I adored him and he was a fabulous inclusion in the story. I did feel like there was material for a follow-on book and if there was then I would definitely read it so all in all I did enjoy this. I adore Tilly Tennant but I’m a bit mixed on this one, it says on the blurb romantic comedy but it didn’t feel that way, it’s a very emotional read and I didn’t find there to be that much humour in it, when I wasn’t upset I was angry with Jude and Harriet, Jude was immature as was Harriet, I didn’t think that Lizzie was overly paranoid she reacted normally well except for accepting it ! Charlie is amazing the one shining character. So sadly for me this is a no, other than Charlie and I do adore I adore Tilly Tennant but I’m a bit mixed on this one, it says on the blurb romantic comedy but it didn’t feel that way, it’s a very emotional read and I didn’t find there to be that much humour in it, when I wasn’t upset I was angry with Jude and Harriet, Jude was immature as was Harriet, I didn’t think that Lizzie was overly paranoid she reacted normally well except for accepting it ! Charlie is amazing the one shining character. So sadly for me this is a no, other than Charlie and I do adore Tilly Tennant but just found it not as happy or entertaining as her usual books. A heartwarming story about friendship, love and family in a setting featuring a mill which has always been attracting to Lizzie's mind, our main character in this book. After her dad's death, Lizzie decided to give her life a change by purchasing a mill, a building that she passed lots of time with her dad during the years. Here Lizzie meets Jude, her handsome and single neighbour, who also cares for his little teenage brother with learning disabilities. It takes a few minutes for them to click. However, Lizzie didn't know what Jude has on his shoulders. Between the restore of the mill, her sister, the anomosity between her mum and stepmum, and Jude's ex, Lizzie has a lot to deal with. I liked this book and, most of all, the cover. It's colourful and happy and it's what attracted me first of all at the beginning. The story was light and heartwarming, however there were some things I honestly didn't like. First of all, Lizzie and her abilities to make decisions on her own. I had the sense she wasn't really capable of thinking on her own sometimes, most of all when it regarded important things. She was swayed by her sister and sometimes her stepmum. It absolutely made sense that Her relationship with Jude was 'tainted' by the way Harriet, Jude's ex, interacted with Jude and the way Jude didn't do anything about it. Their way they interacted was more of a couple than friends. However, the way Lizzie dealt with it, asking her sister what to do and then follow religiously what she said regarding her and Jude, didn't sit well with me. I felt like Lizzie was a little bit...coward. She really didn't face the Harriet problem with Jude like she should have and she cowardly took the way out without giving a chance to Jude to fix the problem. Only after Gracie and her stepmum said that she should consider to take Jude back Lizzie started to think about giving him a second chance. Anyway, it's an easy and light story, I recommend it to read in summer, under the sun. This review was originally posted on Star Crossed Reviews I received this book for free from Netgalley in exchange for an honest review. This does not affect my opinion of the book or the content of my review.Thank you to Bookouture for my copy of this book. I have been reading Tilly's books for quite a few years now so I was excited to read this book that was set in Suffolk (where I live). This story follows Lizzie as she embarks on this crazy idea to restore the mill on magnolia lane. The mill This review was originally posted on Star Crossed Reviews I received this book for free from Netgalley in exchange for an honest review. This does not affect my opinion of the book or the content of my review.Thank you to Bookouture for my copy of this book. I have been reading Tilly's books for quite a few years now so I was excited to read this book that was set in Suffolk (where I live). This story follows Lizzie as she embarks on this crazy idea to restore the mill on magnolia lane. The mill is in a very poor state of repair but Lizzie is determined to get the mill at least in a liveable state and quite possibly a working mill too. I really liked Lizzie. She was an easy character to like. At times I did want to give her a little shake but I totally understood a lot of her feelings and I think I would have been the same in her shoes. It's always easier to see these things from the outside. We meet Jude and his brother Charlie quite early on in this book. Jude seemed like a nice guy if not a bit naive, especially when it comes to his ex. It seemed to me like he just didn't really think about the way their interactions appeared and how that would make Lizzie feel. Charlie was a great character and he made me laugh quite a lot. I liked Lizzie's siblings but I wish we could have seen more of her brother, James. His storyline seemed too unexplored to me. I liked the interaction between Lizzie and her sister Gracie. I also think we could totally have another book just on Gracie (please)! Lizzie is heartbroken her amazing dad has just passed away. Lizzie just doesn’t know what to do with herself. Lizzie and her father shared the same dream of one day owning the old mill on Magnolia Lane. Determined to make this a reality ad leave a legacy to remember her father by. But the mill isn’t quite how Lizzie remembered it. It is in a state of disarray and the amount of work that it needs doing to it, is ginormous. Then Lizzie becomes highly distracted by the stunningly handsome Jude who Lizzie is heartbroken her amazing dad has just passed away. Lizzie just doesn’t know what to do with herself. Lizzie and her father shared the same dream of one day owning the old mill on Magnolia Lane. Determined to make this a reality ad leave a legacy to remember her father by. Then Lizzie becomes highly distracted by the stunningly handsome Jude who lives next door. But when Jude’s ex girlfriend Hattie arrives back on the scene wanting to shed some light on Jude’s shady past. Lizzie has to wonder if everything was much simpler before she to the mill. But is LizIe about to fall in love with someone she shouldn’t? Or is Hattie just set to mix up trouble? When you loose one of your parents, it feels like the world has stopped turning. Especially if you have a very deep connection with that parent. I know what it’s like. The thing you want to do most is keep something alive you both felt strong about to keep the memory alive. A family bond is strong even if you do not see or hear each other every day and even if you do not always see eye to eye. In times of need you can count on each other and when things go wrong you can grow closer than you though When you loose one of your parents, it feels like the world has stopped turning. Especially if you have a very deep connection with that parent. I know what it’s like. A family bond is strong even if you do not see or hear each other every day and even if you do not always see eye to eye. In times of need you can count on each other and when things go wrong you can grow closer than you thought possible. This story is packed to the rafters with emotions. It’s about relationships ending and new ones starting, about sisters narrowing their distance, about people accepting each other, about lives ending and new ones beginning. There is room for laughter and sadness, love and friendship and making decisions. I enjoyed reading Lizzie’s story. Although it was rather sad sometimes, there was a lovely happy ending. I felt there might be some room for a sequel? I hope I am right because I would like to know more about what will happen next. It seemed like it was only the beginning. 4 stars. 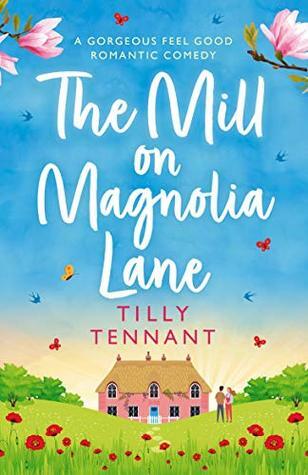 The Mill on Magnolia Lane by Tilly Tennant has the most beautiful and colourful cover perfect for this time of year when you want something light and refreshing that draws you in and invites you to read. With Easter coming up this would be an ideal read if you have some time off or are planning a break away to some where warm and sunny. Although the eventual outcome might be slightly predictable, there are still a few twists, turns and bumps along the road to keep the reader entertained until we The Mill on Magnolia Lane by Tilly Tennant has the most beautiful and colourful cover perfect for this time of year when you want something light and refreshing that draws you in and invites you to read. With Easter coming up this would be an ideal read if you have some time off or are planning a break away to some where warm and sunny. Although the eventual outcome might be slightly predictable, there are still a few twists, turns and bumps along the road to keep the reader entertained until we reach the conclusion. Lizzie Lovell has always been attracted to the abandoned mill on Magnolia Lane ever since she was a child. Every time her father drove past it she felt there was something calling her there. Her father himself wished that he could buy it and restore it to its former glory instead of leaving it sitting there rotting and decaying. But that was never meant to be. Now Lizzie is a grown up women and one who is faced with some life changing decisions. Her family are trying to come to terms with the recent death of her father and, although he had been separated from Lizzie's mother Gwendolyn, his absence is deeply felt. Lizzie's love life is not that great either since her sudden and devastating split from Evan, the reasons for which become clearer much further on. When the reasons did become evident I felt more empathy towards Lizzie and I could see why she was so hesitant to place her trust in a new relationship given how hurt and broken she had been by past experiences. But up until that point I found her frustrating and wished she would just make up her mind and say exactly what she thought. Prior to this Lizzie takes a huge leap of faith into the unknown, she decides to buy the mill on Magnolia Lane in the hopes of getting it working again. In turn she can produce her own flour hopefully to sell on or to use for products in a shop/café she wishes to get up and running. Will this decision prove to be the best thing she has ever done or will it cause more trouble than its worth? Once Lizzie moved on site into a caravan while building renovations were being carried out I thought the plot line regarding the mill itself and Lizzie's long term ambitions took a back seat and the more personal side of the story came to the fore. As Lizzie had contracted a builder to do the work it wasn't up to her to do any of the jobs. I think if she herself had been doing some of the work and needed help from friends it would have been excellent because the title and parts of the blurb suggests this is a personal quest Lizzie has set for herself. But I think this took much of a back-seat as her personal and family life came to the fore. I would have preferred a balance of the two and to see Lizzie struggle that little bit more when it came to the mill and reaching the point of success rather than so much focus on her brewing relationship. I just felt the mill side of things came too easily and a little hardship and pressure would have added some spice to the story. As soon as Lizzie arrives to face the daunting task of seeing the mill back to working order and getting people in place to organise and restore everything she meets her new neighbours Jude and his brother Charlie. Jude has been raising Charlie since the death of their parents as Charlie has learning difficulties but he is one of the stand out characters in this story. He was really well written and portrayed so well. He added humour and warmth when things started to get too tense and he was just the most loveable person. Right from the moment Lizzie sets eyes on Jude she feels a connection and soon they are in a relationship, I thought this all happened so quickly. Within a few days of arriving, having sworn off men and relationships, she had fallen hook, line and sinker. OK Jude was written in such a way that I think all readers would fall in love with him but he did come with attachments and complications and I just thought yes this is a love story but it was just all too fast. I would have loved and a bit more hesitation and getting to know each other more before embarking full scale into a loving unit. But the more the story developed I realised this was more about dealing with how a couple attempt to stay together when faced with many challenges. The above mentioned attachments and complications rear their ugly head more than once as we continue through the story and Lizzie is faced with many challenges and questions. Her loyalty is severely tested when it comes to Jude but also when dealing with the unexpected arrival of her sister Gracie from London. Gracie is fleeing a relationship but she soon discovers she too has brought something extra to the oasis Lizzie has envisaged for herself which is rapidly turning into a maelstrom of emotions and problems. I admired Lizzie for taking in Gracie and working on their sisterly relationship because I would have told her where to go considering she was up to her eyes with keeping an eye on work on the mill and trying to establish could things with Jude work out? Then into the equation comes their step mum Florentina who again was a lovely character and was there to give emotional support when needed. I really wanted Lizzie to express to Jude how she was feeling about certain things. I thinks she was slightly jealous as to what was going on and she wasn't ready for a competition for someone's affections. It was either her or nothing but Jude was caught between a rock and a hard place. Trust and being open with one another were two things that needed to happen and I questioned would the ever occur? I know there will be a lot of people out there who, like me, are huge fans of Tilly Tennant and who will be waiting eagerly for his latest book and I can confirm that I don’t think they will be disappointed by her latest offering. This book joins Lizzie at a very sad time in her life when she has just lost her dad and she is feeling a little adrift. She decides to buy the derelict old mill on Magnolia Lane that her father always longed to own and decides to renovate it in his honour, and so her a I know there will be a lot of people out there who, like me, are huge fans of Tilly Tennant and who will be waiting eagerly for his latest book and I can confirm that I don’t think they will be disappointed by her latest offering. Restoring the old windmill is a much bigger job than Lizzie bargained for, especially when she is distracted by her new next door neighbour Jude, who has temptingly twinkly eyes and a body to die for. But when Jude’s ex- girlfrie When Lizzie loses her larger-than-life Dad she doesn’t know how to move forward. Encouraged by a childhood dream she shared with her beloved father, she is determined to continue his legacy and moves to the old Mill on Magnolia lane, a place he had always longed to own. Following her dad’s death, Lizzie buys an old mill, which her and her father had always dreamed of restoring. It turns out to be a much larger job that she expected, both financially and in the amount of work needed. Meeting her new next door neighbour, Jude begins to wonder if her luck has changed, at least on the romance front! That is until she meets Jude’s ex-girlfriend, Harriett…. What a lovely book! An original story of a grief stricken Lizzie restoring an old derelict Mill. Do her plans sound crazy?.....absolutely!! Personally, I couldn’t think of anything worse of spending all that money to be left with the ruin of an old windmill and an old caravan to live in! But the story really works! I really liked all the main female characters – Lizzie, Gracie, Gwendolyn and Florentina – and felt they all blossomed throughout the book. I have to admit, Gracie was my favourite and I loved her relationship with sister, Lizzie. There were a few little things which niggled me as the story progressed though! Whilst Jude sounded very aesthetically pleasing, he was very naïve and trusting where ex-girlfriend Harriett was concerned, and at times I really felt for Lizzie with how he was with her. I also didn’t like Harriett for the same reasons! The one thing that stood out for me though with this book was the location, the scenery and of course the windmill. Even the name, The Mill on Magnolia Lane, sounded so beautiful and whenever I was reading about the windmill, it conjured up lovely images in my mind! All in all, it was a lovely, easy to read book. I didn’t find it as light-hearted as some the author’s other books, but that’s not necessarily a bad thing! The story flowed well and kept me interested throughout. It did have a lot of emotions to deal with in the ways of love, death and family relationships, but it was well written and tugged at my heartstrings at times. Would love to perhaps see a follow up book to carry on the storylines of some of the characters!! Would definitely recommend. Having read a lot of Tilly's books previously and loved them all, I was very much looking forward to reading this one, The Mill on Magnolia Lane, her latest venture into escapism. So with that said, I did have very high hopes for this one, but the honest truth is that I have mixed emotions about it and really didn’t enjoy it as much as I thought I would. I just don’t think it has that same spark as all her other books that I’ve read of hers. I found it to be a very good story which was well writ Having read a lot of Tilly's books previously and loved them all, I was very much looking forward to reading this one, The Mill on Magnolia Lane, her latest venture into escapism. So with that said, I did have very high hopes for this one, but the honest truth is that I have mixed emotions about it and really didn’t enjoy it as much as I thought I would. I just don’t think it has that same spark as all her other books that I’ve read of hers. I found it to be a very good story which was well written, but at the same time, I felt as if some of the story plots were rushed or not given enough attention. It would have been beneficial if some of the storylines could have been better developed and more time spent with them. Like the character of James for example, there was hardly any mention or involvement of him through the story but then something completely unexpected happens to him at the end, which kind of came out of nowhere and doesn’t really have enough relevance to the story, just felt a bit random. Having read other reader's reviews of this book, I am glad to see that there are a few readers that did indeed enjoy this book, which to me, means it is true what they say, certain books just aren't for everyone. Some good points about this book though, I really liked the character of Charlie, he was well developed and came out with the funniest of things at times, it was hard not to like him. I liked the setting of the story, being the renovating of the old mill and the obstacles that Lizzie had to keep overcoming with respect to that. It felt real, in that these things never go to plan. I really liked that this story wasn’t just focused purely on romance, it dealt with ongoing relationships between family members and external family members such as the step mother, and so was interesting to see how certain situations arose and how they were dealt with throughout the story. This one just wasn’t for me. Usually I enjoy Tilly Tennant’s books but this one missed the mark. Main character Lizzie was very annoying, her sister Gracie was even worse and their mother Gwendolyn takes the cake for most annoying character in this boo.k. Constantly complaining. Lizzie strikes up a relationship with Jude who seemingly is still in love with the mother of his child Harriet. We never really get any closure on that. Harriet remains lurking in the shadows. The whole thing makes no se This one just wasn’t for me. Usually I enjoy Tilly Tennant’s books but this one missed the mark. Main character Lizzie was very annoying, her sister Gracie was even worse and their mother Gwendolyn takes the cake for most annoying character in this boo.k. Constantly complaining. Lizzie strikes up a relationship with Jude who seemingly is still in love with the mother of his child Harriet. We never really get any closure on that. Harriet remains lurking in the shadows. The whole thing makes no sense. The best things about this book were Derek and his wife, Charlie, and in some ways Florentina. But overall the characters seemed underdeveloped and the plot went in too many directions. We barely hear anything about the brother James then bam, a strange plot that the reader can’t reakky care about because what do we really know about this character? Nothing. To me the “romance” here just seemed dirty and creepy, like Jude was somehow fooling Lizzie. Then there was Gracie and her selfishness, Gwendolyn complaining about Florentina but then they are bffs by the end of the book, etc. I think if some of the plots here had been explored more maybe in a series rather than one book it could have worked better. As it stands the author tried to cram too much junk into a small book and just made an overflowing mess. This review has been hidden because it contains spoilers. To view it, click here. I recieved an early preview copy of this book from Netgalley in return for an honest review. I have read and enjoyed books by Tilly before, so I was excited to read this one. After the death of her father Lizzie decides to make the most out of her life, and buys a derelict Windmill in the town where her father grew up. It is a reminder of the trips that they used to make together when she was a child. Lizzie is trying to make a fresh start, but she soon finds that her family, who do not always get I recieved an early preview copy of this book from Netgalley in return for an honest review. Lizzie is trying to make a fresh start, but she soon finds that her family, who do not always get along with each other descend on her. She also finds out that her neighbour, Jude is attracted to her, but she doesn't know if she should get involved or not. I thought that the setting of the book was stunning. It is a perfect read for warm summer evenings. I would have liked more details about the project, as I felt that this was skimmed over. I did not warm to the character of Jude very much. I thought that the relationship moved to quickly, and lacked substance. I liked the character who was his brother though. I love Tilly’s books, and this one didn’t disappoint. Lizzie’s life is thrown out of kilter when her beloved father dies so, having also recently split up with her boyfriend, she decides to live for the moment and buy a dilapidated mill that her father always had his eye on. She soon meets Jude and they get on famously, but he has a past. There’s his ex, Harriet, with whom he has a toddler, Artie, and he also looks after his brother, Charlie, following the deaths of their parents. Jude and Harriet I love Tilly’s books, and this one didn’t disappoint. She soon meets Jude and they get on famously, but he has a past. There’s his ex, Harriet, with whom he has a toddler, Artie, and he also looks after his brother, Charlie, following the deaths of their parents. Jude and Harriet seem to be a bit too friendly for Lizzie’s liking so that causes some unrest. Then there are other significant characters; Lizzie’s new-dumped and newly-pregnant sister, Gracie, and her very nice stepmother, Florentina. Lizzie tries to juggle the mill renovations, her mum, her sister, her stepmother (who loses everything in a fire), and Jude, so there are lots of twists and turns but a happy ending. A warm, funny, and romantic read, ideal for the summer. Thank you to NetGalley and Bookouture for an advance reader copy in return for an honest review. I have read the author before and enjoyed her books. This one I enjoyed also but it wasn’t my favourite of her books. The storyline was a good one, young woman buys and renovates an old mill in memory of her father. The parts of the story dealing with the mill itself are fascinating and it had me picturing the scenes in my head. For me, however, the other parts of the story just didn’t hold my attention quite so much and I found myself skimming a lot. This would be an ideal summer read for those l I have read the author before and enjoyed her books. This one I enjoyed also but it wasn’t my favourite of her books. This would be an ideal summer read for those looking to escape for a while into someone else’s life. Please note this review is based on my personal feelings and plenty of others will, I’m sure, love the story. We meet Lizzie after her father dies. Things are not easy, but she wants to continue his dream and starts restoring the old windmill on Magnolia Lane. She then meets Jude and the two of them hit it off immediately. Jude didn’t have an easy life. After both his parents died, he had to take care of his brother Charlie and then there are also his ex Harriet and his son. Harriet still spends a lot of time with Jude and Lizzie doesn’t like that. She is very suspicious and can’t fully trust him. On top of that, there is her family, who are trying to give their opinion on Jude as well and they have their own problems to deal with too. I have always liked Tilly Tennant’s writing style, it’s fresh, cute, gripping and young. Unfortunately, something was missing in this book, I didn’t get 100% into it. The storyline was missing some details and I also found it hard to relate to the characters. The setting of this book is wonderful and the author captured it beautifully. I really enjoyed diving into this story, it’s a great summery read. I really enjoyed this book. A charming story of family relationships, new beginnings and romance. A lovely feel good story. I really enjoyed the unusual setting of this book - around the renovation of a windmill. The countryside and village were lovely. I liked all of the characters and their stories and interactions. A lovely cosy read perfect for the summer or a cosy afternoon on the sofa. Thank you to NetGalley and the publisher for the opportunity to read this book in exchange for an honest r I really enjoyed this book. A charming story of family relationships, new beginnings and romance. A lovely feel good story. I really enjoyed the unusual setting of this book - around the renovation of a windmill. The countryside and village were lovely. I liked all of the characters and their stories and interactions. tl: dr: A woman finds love and surprises in the aftermath of her father's death. Lizzie's father dies. She is the daughter of his first wife. There is baggage there, as expected. To add insult to injury, Lizzie's had her own sorts of self-doubt before her father's untimely demise. She makes a huge life-change deciding to renovate a gorgeous, derelict mill. This gentle book is really about a woman renovating herself as she works on the building (sort of in the vein of A Year in Provence or Under the Tuscan Sun). Like those other books, this one does a great job of transporting readers to a magical space. Lizzie does get a happy ending as well. Great vacation read for someone who is looking for good writing and love. Lizzie buys the old mill that her late father always talked about owning. She is determined to do this on her own, but soon meets new neighbour Jude, and his younger brother. Things are complicated and she isn't sure he is over his ex, who features in his life far too much for Lizzie's liking. As she needs to help her family out more, will Lizzie be able to take a chance on Jude? I received this book in exchange for a voluntary and honest review. A great read about love, loss and relationships. The story of renovating the old mill simmers away in the background as we get to live Lizzie’s life with her. The relationships she has with her family and any potential life partners are all interweaved together to create a moving novel. This book is relatable to most people and shows how complicated families are and how it effects your life. I enjoyed this book a light the romance was cute and the other familial relationships the book featured were very well done and I liked that it allowed development in that area too. Characters were likeable and the story felt realistic. Overall a light easy read. Tilly Tennant was born in Dorset, the oldest of four children, but now lives in Staffordshire with a family of her own. After years of dismal and disastrous jobs, including paper plate stacking, shop girl, newspaper promotions and waitressing (she never could carry a bowl of soup without spilling a bit), she decided to indulge her passion for the written word by embarking on a degree in English an Tilly Tennant was born in Dorset, the oldest of four children, but now lives in Staffordshire with a family of her own. After years of dismal and disastrous jobs, including paper plate stacking, shop girl, newspaper promotions and waitressing (she never could carry a bowl of soup without spilling a bit), she decided to indulge her passion for the written word by embarking on a degree in English and creative writing, graduating in 2009 with first class honours. She wrote her first novel in 2007 during her first summer break at university and has not stopped writing since. She also works as a freelance fiction editor, and considers herself very lucky that this enables her to read many wonderful books before the rest of the world gets them.